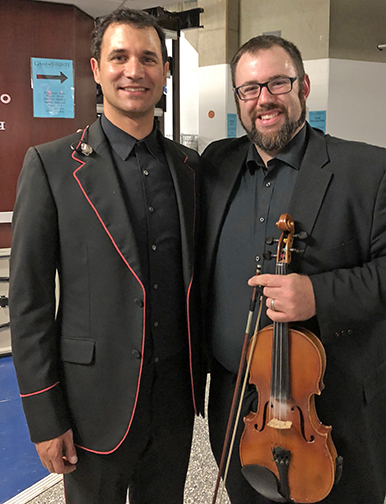 Pattonville High School orchestra director Michael Dunsmoor had the rare opportunity to perform with "Game of Thrones" composer Ramin Djawadi during the Game of Thrones Live Concert Experience on Oct. 5 at the Enterprise Center in St. Louis. Djawadi served as the conductor for the concert and Dunsmoor was one of 14 violinists performing during the event. "It was an absolutely awesome experience," said Dunsmoor, who is union musician and received the call to play for the concert about two weeks before the performance. "It's an incredibly rare opportunity to play contemporary music (from film/TV) underneath the composer's own baton, and I am incredibly grateful I was available to play violin." The sole rehearsal and sound check was held for about two hours during the afternoon of the concert. The orchestra consisted of 14 violinists, five violists, five cellists, three bassists, three French Horns, three bass trombones and members from a Washington University Choir. Many of the musicians were members of the St. Louis Symphony or have played for other productions at the Fox Theatre or MUNY, according to Dunsmoor. Dunsmoor was pleased to meet the composer and discuss their shared alma mater. Both graduated from the Berklee College of Music. Above, Dunsmoor, right, is shown with "Game of Thrones" composer Ramin Djawadi. 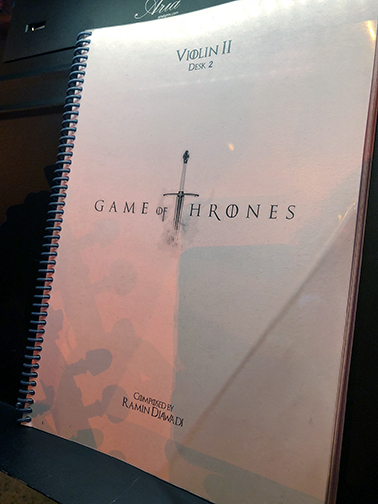 Below, a photo of the cover of the musical score Dunsmoor used during the performance.